Facebook has been trying to squash Snapchat for a long time. Remember (the other) Poke? Or Slingshot? Or that time it tried to buy the company outright? None of those really worked out. Over the past year, though, Mark Zuckerberg and company appear to have found a way to stunt Snapchat’s growth: Make a total rip-off, but do so within an app that’s already massively popular. That app, Instagram, added its Snapchat-aping “Stories” feature last August, almost a full five years after Snapchat launched. But according to an Instagram announcement earlier this month, the feature has already hit 200 million daily users. 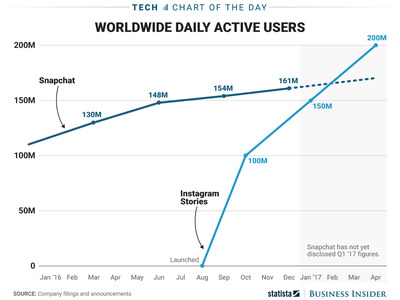 This doesn’t mean people will suddenly stop using Snapchat; it’s still hard to tell how many people go to Instagram specifically for the Stories bit. But that’s not really the point. You can bemoan Facebook’s robotic lack of innovation all you want, but the reality is that all of its apps are huge. It’s never had to out-design Snapchat to stop it from siphoning off users and potential ad dollars. People may not leave Snapchat in droves because of Instagram Stories, but they’re probably less likely to download it in the first place. That’s good news for Facebook, creative pride be damned.